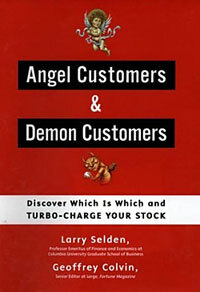 “Angel Customers and Demon Customers” (also published as “Killer Customers”) is a book all business owners should read. One of the oldest myths in business is that every customer is a valuable customer. Many businesses strive to constantly acquire new customers without considering whether these customers will be profitable or perhaps even loss makers. Many businesses don’t realise that some of their customers are deeply unprofitable, and that simply doing business with them is costing them money. Often the top 20 percent of customers generate almost all of a company’s profit, while the bottom 20 percent are actually destroying value, wasting your time and causing you angst. The cutting-edge companies featured in the books case studies, in industries ranging from retail to manufacturing to financial services, are taking a fundamentally new look at how they treat their best and worst customers. 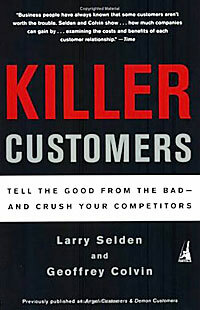 Most importantly the book explains how to evaluate and group customers into segments, moving away from measuring the “average revenue per customer”, instead classifying customers into groups to decide which ones aren’t worth working with and which ones should be treated better. Some reviewers deride the content of this book as obvious, but even more obvious is that a tremendous number of businesses don’t get it. I see the problems the authors describe play out repeatedly, from perspectives as a professional within my own industry, as an investor, and as a consumer. This book is an exciting rebuttal against the mentality of “The customer is always right” (what if the customer wants to pay less than your cost?) and a wakeup call to move forward from smokestack-age business organization in the information-age economy. The book is co-authored by Larry Selden: a professor emeritus of finance and economics at Columbia University Graduate School of Business and Geoffrey Colvin, Fortune magazine’s senior editor at large & co-anchor of Wall Street Week with Fortune on PBS. Sure some clients will always be expensive to maintain. Thats a given. I have always felt that every new client is one constant learning experience, and that the next client, that I invest the time in acquiring will cost less to acquire and maintain, compared to the earlier ones. I suppose all of the questions I have will be answered in the book, but how would you go about cutting the “bottom 20%” of your customers tactfully? If done in the wrong way (and I don’t know the right way), couldn’t that create backlash and hurt your company in other ways (i.e., bad publicity, foul word of mouth, etc.)? Is the book attempting to cover every business industry? Yes, I can see how that can be a polite way to part ways with a troublesome customer. I feel, though, that having “annoying” customers and loss making customers are a bit different. If the annoying customers are still bringing in revenue, I don’t see how cutting them off would be good for the company’s overall bottomline. (Perhaps it would make a better working environment.) At times we just need to put up/co-exist with irksome people (i.e., co-workers, family members, neighbors, etc. ), especially if they’re returning, full-paying customers, right? I must say that these advices are valuable and something that I will look up to. There is a personal reason, my father has a business to and it was going pretty well. He got complacent and too dreamy and did not stick to the basics like the ones you said and then the day came where it all fell apart. I had to stop my education and take up work and now I have a start up and trying hard not to make the same mistakes. In order to have a profitable business it is important to calculate if the “Angel Customers” generate enough profit to cover the expenses the “Demon Customers” generate.